What’s the Status of Egypt’s Christians? 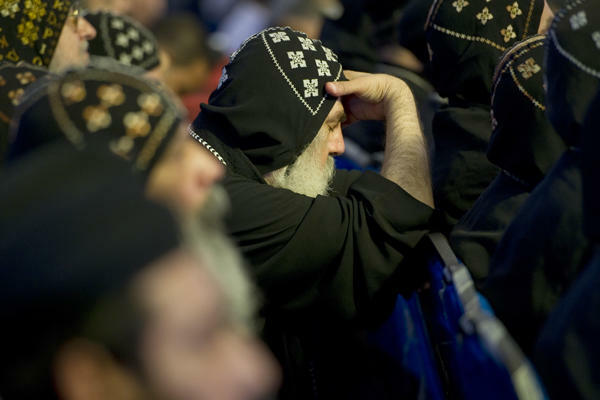 WITH THE SELECTION OF A NEW POPE on Nov. 4, Egypt’s Coptic Orthodox Church again has a spiritual leader as the country goes through a turbulent transition that has been particularly difficult for Christians. Tawadros II, the 118th pope, must fill the shoes of a beloved former leader (he died in March) at a time when sectarian attacks have increased, many are fearful of the rise of Islamist politicians, and the church’s political role is being debated. Q: Who are Egypt’s Copts? Though the word ‘Copt’ historically meant Egyptian, it is now used to refer to Egyptian Christians. Christianity is believed to have come to Egypt in the 1st century with the apostle Mark, whom Copts consider the first pope of Alexandria. The Coptic language, which was spoken in Egypt before Arab con-querors introduced Arabic, is still used in the church’s liturgy. The majority of Egypt’s Christians belong to the Coptic Orthodox Church, though some belong to other churches and denominations. Christians in Egypt are estimated to make up less than 10 percent of the population, though their exact numbers are the source of much controversy. The Coptic Orthodox church became a distinct church after the Council of Chalcedon in AD 451, when it split from the larger church over a dispute about the nature of Christ Jesus’ divinity. Q: What role does the church play in Egypt’s politics? Egypt’s last pope, who led the church for 40 years, played a political as well as spiritual role. He supported Egypt’s former President Hosni Mubarak in what was seen as an attempt to secure the regime’s protection of Christians. Under his leadership, many Christians retreated from public and political life, relying on the church to lobby for them and protect them. He died in March. Q: How might the church’s political role change with the new pope? In interviews after his selection, the new pope spoke of the church focusing on spiritual work. But Samia Sidhom, an editor at the Coptic newspaper Watani, says that until Christians are equal citizens in Egypt, it will be hard for the pope to remain apolitical. And indeed, in the days after he was chosen as the 118th leader of the church, he spoke out strongly on Egypt’s new constitution. Many secular and liberal Egyptians have complained that Islamists have controlled the drafting of the constitution and are using it to increase the influence of Islam on the state. “A constitution that hints at imposing a religious state in Egypt is absolutely rejected,” the new pope said. Q: How might the fate of Egypt’s Christians affect the region? In the year after the revolution, attacks on Christians and churches rose sharply, though sectarian incidents had been rising during the last years of Mubarak’s reign. Churches were burned, clashes broke out, and last October, the Army attacked a mostly Christian protest, leaving more than two dozen people dead. Egypt has the region’s largest Christian community, and Christian populations in many Middle Eastern countries are decreasing and struggling. The Iraq war was disastrous for Iraq’s Christian population, and Syrian Christians, many of whom support the regime of President Bashar al-Assad, are worried about what will happen to them if he falls. “Whatever happens in the Coptic community is bound to have certain echoes in the rest of the region,” she says.